The responsiveness of high-income earners to taxation is a central aspect of tax system design. This column presents patterns in the tax elasticity of top earners for up to 30 countries over a period of 115 years. Tax elasticities vary tremendously over time, space, and income, with a J-shaped pattern emerging over the past century. Tax avoidance behaviour strongly influences the elasticity of the very top earners, while there is less support for the role of labour supply responses across earners. 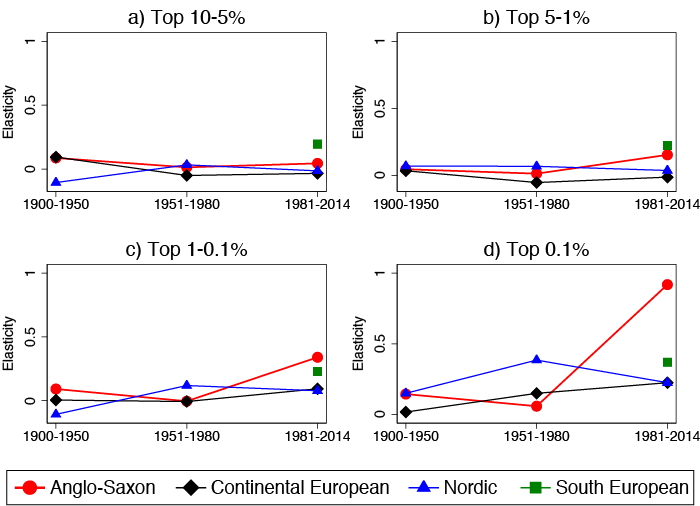 In a new paper (Rubolino and Waldenström 2017), we compile a dataset containing tax rates, top income shares, and control variables for up to 30 industrialised countries and a period of 115 years, 1900–2014, to analyse the evolution of the elasticity of top income shares with respect to the net-of-marginal tax rate across subperiods, countries, country groups, and income levels within the top of the distribution (the full dataset is available on our personal websites). Figure 1 shows the long-run evolution of the cross-country top percentile elasticity measured within 20-year periods between 1900 and 2014, controlling for country fixed effects and country-specific time trends. A clear J-shaped pattern emerges. The elasticity was 0.11 in the pre-1920 period and then fell, gradually, down to around 0.05 in the sixty years thereafter. Then, in the 1980s, the elasticity increases rapidly up to 0.3 in the most recent period. Separating between different groups of top income earners is crucial. The previous top income literature (e.g. 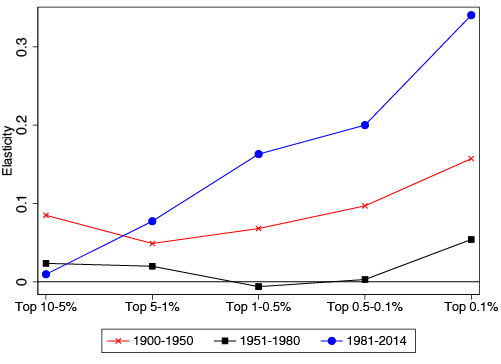 Atkinson and Piketty 2007, Roine and Waldenström 2015) has shown how the highest-earning groups often dominate the entire top decile’s income share. Figure 2 therefore splits the top income decile into five separate income groups and estimates their tax elasticity separately in three subperiods: 1900–1950, 1951–1980, and 1980–2014. The results show that there is a positive income gradient in the top tax elasticity – the tax responsiveness increases the higher up the income distribution one gets. However, we find that the slope of this gradient varies over time. It was relatively small in the first half of past century, and virtually flat in the first three post-war decades. In the recent period since 1981, it has been steep with a top 0.1 elasticity being more than four times the elasticity in the Top 5-1 group and even more compared to the bottom half (where the elasticity is zero). Differences in economic and political institutions across countries may be important for how taxpayers respond to income taxation, e.g. through the workings of specific tax laws allowing tax avoidance or social norms towards working (Piketty et al. 2014). Top income shares have also increased faster in Anglo-Saxon countries than in continental European countries. We examine these geographic and cultural factors by splitting our country sample into four groups – Anglo-Saxon, continental European, Scandinavian, and South European – and estimate top elasticities over time. Figure 3 shows that there are no important differences across these country groups for most periods and top income fractiles. However, there is one notable exception: top income earners in Anglo-Saxon countries appears to be have become much more responsive to taxes than top earners in other developed countries during the post-1980 era. This appears to be an important driver of the main results shown above. Possible explanations for higher tax elasticities among top earners can be found in the public finance literature, some emphasising the role of real (labour supply) responses while others highlight the role of tax avoidance activities (Feldstein 1995, Slemrod 1995, Saez 2017) or bargaining activities (Piketty et al. 2014). Our data are not rich enough to allow for conclusive analyses, but we do offer some tests of these and other hypotheses. We find that tax avoidance behaviour, in the form of shifting income across differently taxed labour and capital incomes, strongly influences the elasticity of earners in the absolute top but less so on those lower down the top decile. We find less support for ‘real responses’, which we measure using aggregate indicators of economic activity. The World Wars and major financial crises are found to play a role. Wartime top percentile elasticities fall, but only in belligerent countries, while banking crises and currency crises have the opposite effect. However, the largest influence on tax elasticities comes from including country fixed effects and, quite importantly, country-specific trends. This suggests a large role of institutional and market-related factors that we are still unable to fully identify. Our study attempts to shed light on the historical and institutional links between income taxation and income inequality. The top income tax elasticity is by no means a constant, structural parameter, but rather one that varies over time and space and also over the level and type of income. Needless to say, a paper with a scope such as ours leaves many stones unturned. We hope that our work will stimulate further research on understanding the nature of tax responses among groups in the top of the income distribution. 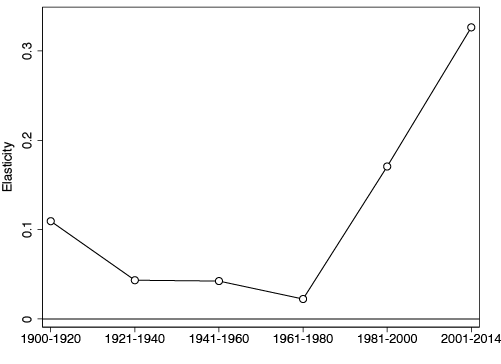 Atkinson, A B, and T Piketty (2007), Top incomes in the United Kingdom over the Twentieth Century: A contrast between Continental European and English-Speaking Countries, Oxford: Oxford University Press. Feldstein, M (1995), “The effect of marginal tax rates on taxable income: A panel study of the1986 Tax Reform Act”, Journal of Political Economy, 103: 551–572. Piketty, T, E Saez, and S Stantcheva (2014), “Optimal taxation of top labor incomes: a tale of three elasticities”, American Economic Journal: Economic Policy, 6(1): 230–271. Roine, J, and D Waldenström (2015), "Long-run trends in the distribution of income and wealth" in A B Atkinson, and F Bourguignon (eds. ), Handbook of Income Distribution, vol. 2A, Amsterdam: North-Holland. Rubolino, E, and D Waldenström (2017), “Trends and gradients in top tax elasticities: Cross-country evidence, 1900-2014”, CEPR Discussion Paper No. 11935. Saez, E (2017), “Taxing the rich more: Preliminary evidence from the 2013 Tax Increase”, Tax Policy and the Economy 31, forthcoming. Saez, E, J Slemrod, and S H Giertz (2012), “The elasticity of taxable income with respect to marginal tax rates: A critical review”, Journal of Economic Literature, 3–50. Slemrod, J (1995), ”Income creation or income shifting? Behavioral responses to the Tax Reform Act of 1986”, American Economic Review, 85(2): 175–180. A notable exception is the study by Piketty et al. (2014) of the tax elasticity of the top percentile in a sample of countries since 1960.